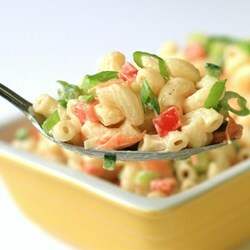 Whether it’s sitting next to some smoky ribs or just a humble hot dog, this deli-style macaroni salad will always be a crowd-favorite, as long as you pay attention to a few key details. Whisk 1 cup mayonnaise, vinegar, Dijon mustard, salt, black pepper, and cayenne pepper together in a bowl until well blended; whisk in sugar. Stir in celery, red bell pepper, carrot, onions, and jalapeno and poblano peppers. Refrigerate until macaroni is ready to dress. Bring a large pot of well salted water to a boil. Cook elbow macaroni in the boiling water, stirring occasionally until cooked through, 8 to 10 minutes. Drain but do not rinse. Allow macaroni to drain in a colander about 5 minutes, shaking out moisture from time to time. Pour macaroni into large bowl; toss to separate and cool to room temperature. Macaroni should be sticky. Pour dressing over macaroni and stir until dressing is evenly distributed. Cover with plastic wrap. Refrigerate at least 4 hours or, ideally, overnight to allow dressing to absorb into the macaroni. Stir salad before serving. Mix 1 tablespoon mayonnaise and 1 tablespoon water into salad for fresher look.